PROFILE : : Design leader with 15+ years of hands on experience in concept development & design that drives strategies and products forward. Ability to handle multiple projects in a fast-paced environment and participate in the complete product development lifecycle. Collaborates well in cross-functional environments to create effective design solutions that balance business and customer needs. Conceptualize, design, prototype, test, and build the company-wide responsive intranet site that redefines and improves efficiency and productivity by creating a hub that allows internal employees to easily obtain knowledge, collaborate and complete tasks efficiently. Effectively bringing all parts and tasks together to create a seamless interface between existing tools. Modernizing based on UX/UI best practices, testing and interviews that parallels the Disney consumer facing web experience. Everything you want and need, as a Disney employee, in your pocket. An on-boarding app for new Disney employees to make their first days and months, easier and more streamlined. To give them web access to all the resources they need, focusing on reducing and removing current on boarding pain points. Work with and advise students to design and develop native iPhone apps in fulfillment of requirements for a master’s degree in digital social media at the Annenberg School for Journalism and Communication, where student teams define, develop, launch, and operate a live and publicly available, digital product for their capstone project. The eHow Spark project had two main goals: (1) to get more traffic from social sources (expanding from just google referrals) (2) to build a community that would leverage the existing high volume of eHow traffic and give visitors a reason to stay and share—a platform to provide their own expertise / inspirations / solutions with like-minded users. I was the creative lead throughout the entire Spark lifecycle, working intimately with product, editorial and engineering leads. I was instrumental in strategizing competitive positioning (vs. similar services like Houzz, Snapguide, etc. ), brand architecture, community incentives, and mobile strategy. I played a key role in keeping the team aligned, motivated and productive. One of the notable successes resulted in sustained 2-3x social referral traffic to the site. Part of the leadership team that was instrumental in driving the product strategy. Participated in two company-wide Hackathons, placing in one of them with a new product that would increase engagement throughout the site, provide multiple opportunities for monetization, and raise the bar on overall site quality. Gallery of a few eHow projects. Designed, architected, and collaborated with product and engineering leads to build the first Trails.com native iOS app. Initially a TV show on the WB, then moved online to partner with Yahoo! Music to showcase exclusive video interviews & performances featuring A-list artists including Shakira, Alicia Keys, Beyoncé, plus original content reality segments (Mic Pass, Cover Song, On Location, Another Side Of, 100 Concerts/100 Days). Art Directed and designed three years of program renewal with Pepsi. 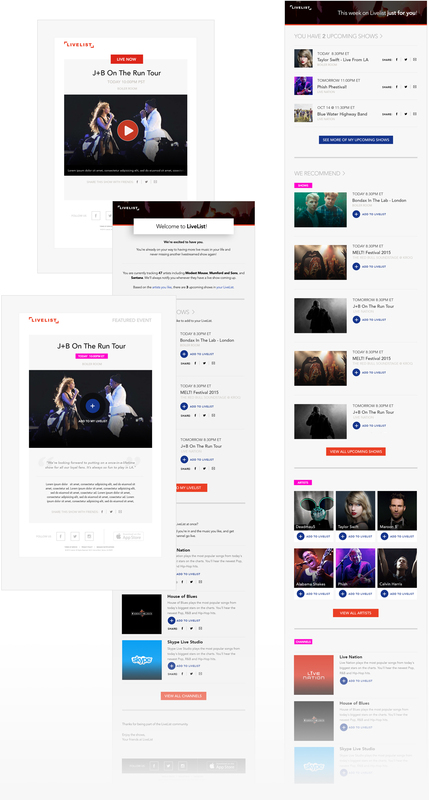 Designed the official Grammy coverage sites for the 46th – 49th Annual Grammy Awards. Part of a team to pioneer the “My Grammy Moment” contest, where unsigned artists vied to perform live with Justin Timberlake on the 49th GRAMMY Awards—the winner was determined by text messages and Internet votes. Competitive insights through real-time metrics and historical trends tracking. Responsible for homepage responsive redesign, partner pages, SEO pages, promo pages, email templates, marketing campaigns. Focused on optimizing site performance and spearheaded efforts to improve registration and conversions though A/B testing. Redesigned logo/branding to drive home the product value proposition.Improved college matching quality by auditing current user engagement and redesigning flows that increased participation and yielded better data for the matching algorithm. Yahoo! 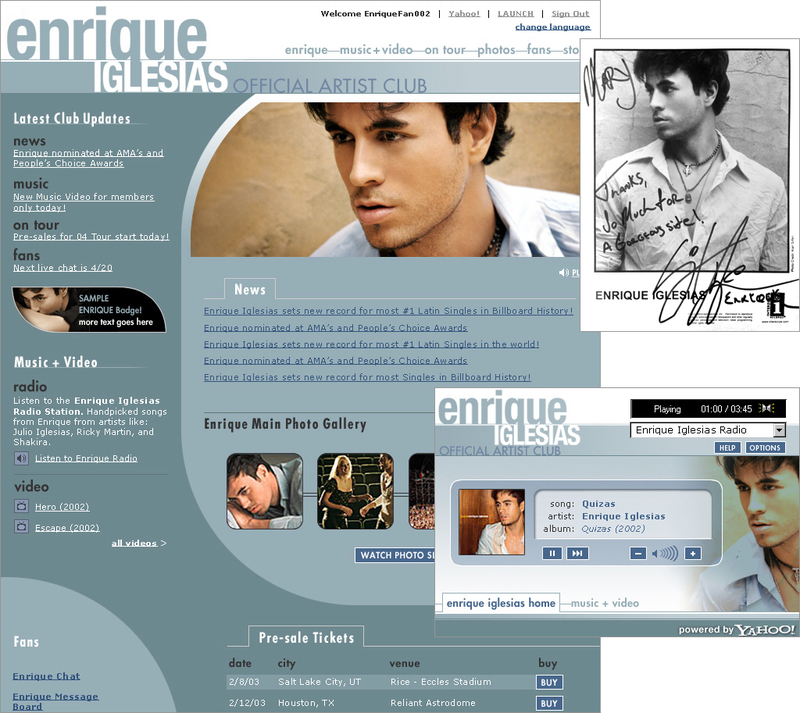 Music offered their services to provide Official Artist Clubs/websites for Dixie Chicks, Enrique Iglesias, Eagles. Note the snazzy underlined links. 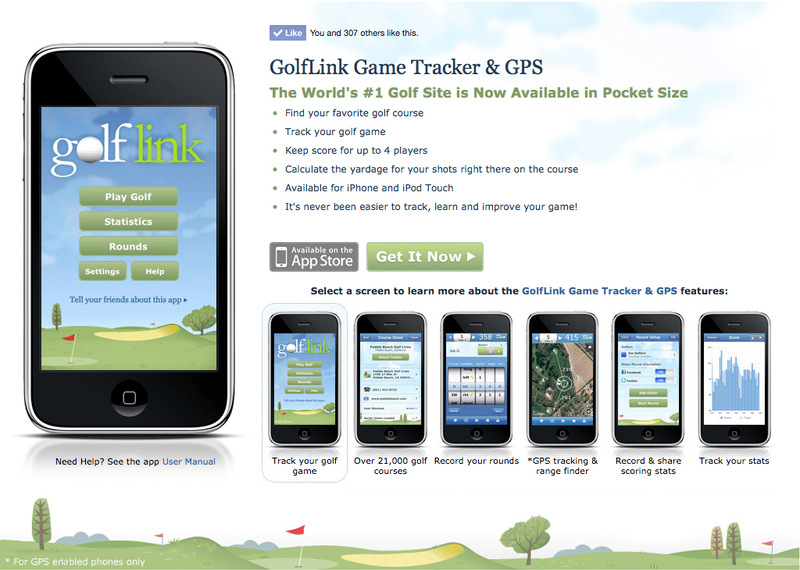 Designed, architected, and collaborated with product and engineering leads to build the first Golflink.com native iOS app. Yardage maps was based on mapped gps locations and oriented the map so that the tee was always at the bottom of the screen while the pin was always at the top. Enabled players to plan and strategize their game before hitting the course. Worked on prototype app which would track gps locations of where the ball landed so user’s could replay and strategize their game, get club recommendations, and improve. I don’t even play golf, but it was a super fun project with a great team. Features included CD ripping and burning, access to LAUNCHcast and the Yahoo! Music Unlimited music subscription service, playlist creation, transfer of music to select portable devices such as mp3 players and USB flash drives. The program allowed Yahoo! Messenger users to stream music to one another and browse one another’s playlists. Subscribers to Yahoo! Unlimited could add entire songs to their collections. 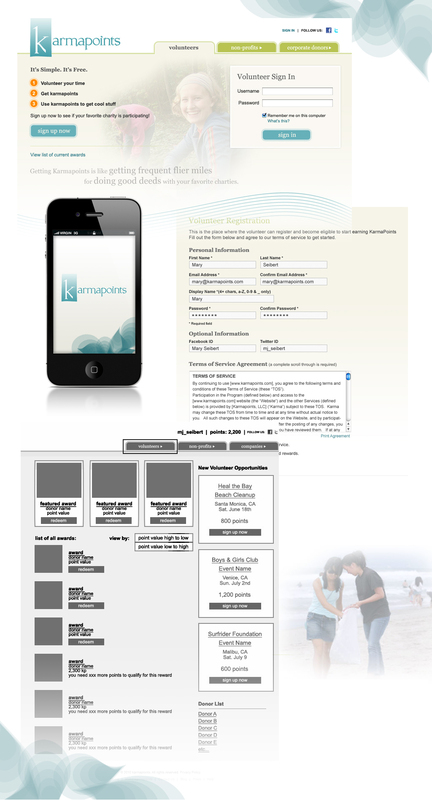 Worked with developer to brand, flow and design. Native iOS app. Karmapoints : : Volunteer your time. Get Karmapoints. Redeem for cool stuff. The challenge for non-profit organizations of finding volunteers (actual bodies) week after week, is incredibly difficult. Most volunteers would only remain active for 1 event, then disappear. The idea was to create a rewards program (like frequent flyer miles) for recruiting, retaining and motivating volunteers to help solve the problem of volunteer retention while also giving non-profits the opportunity to give back to the volunteers who give so much. Worked with a passionate team of volunteers to create and launch the KarmaPoints.org platform. 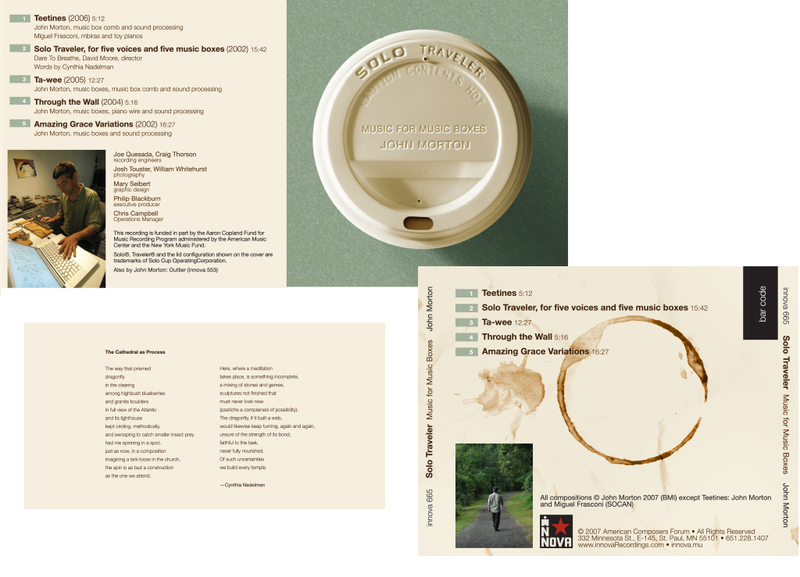 Collaborated with composer John Morton to design and layout cd cover art. You can listen to some samples here from his cd, Solo Traveler. Motion : : Some little movies from days of yore. Small oil sketches from over the years.